Note: This article was first published on 19th Match 2019. 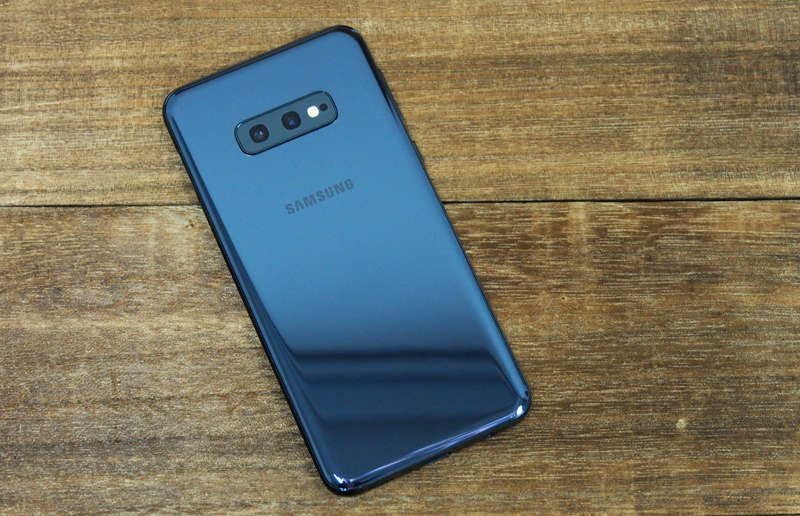 The Samsung S10e ('e' stands for 'Essential') is the budget model in Samsung's new Galaxy S10 lineup. 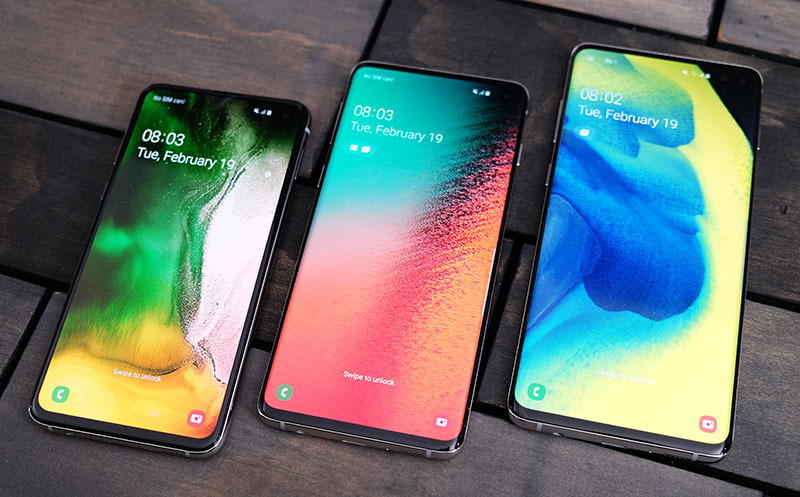 Like Apple's iPhone XS, XS Max, and XR lineup, Samsung is trying a three-model approach this year with two premium models (the Galaxy S10 and S10+) and one budget model. There's actually a fourth, even more premium, S10 5G, but we don't know when that will launch. 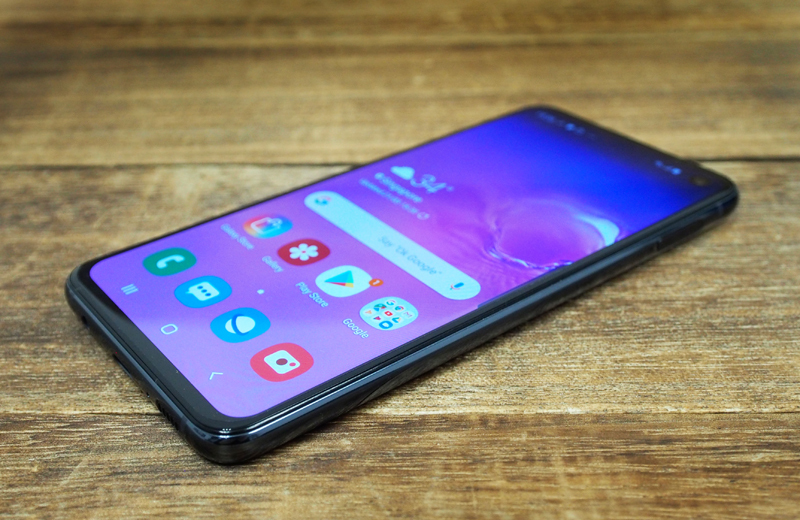 Compared to the S10 and S10+, the S10e has a flatter, smaller, lower-resolution display, lacks an ultrasonic in-display fingerprint scanner, and loses the 2x optical zoom telephoto rear camera lens - but it's also much more affordable at just S$1,078, which is S$220 cheaper than the cheapest S10. So, should you save some money and go for the S10e, or spend a bit more to get one of the more premium models? Let's find out. The first thing you'll notice about the S10e is that it has a flat display, something we haven't seen on a Samsung flagship since the Galaxy S7. The lack of curves makes the bezels slightly thicker, and it doesn't look quite as premium; but on the plus side, it does make the phone easier to hold and there's no risk of accidentally touching the display. The compact size and flat display make the phone feel very similar in hand to the iPhone XS, and in terms of dimensions, they're actually very close, although the S10e is much lighter, at just 150g. Instead of an ultrasonic in-display fingerprint scanner, the S10e uses a side-mounted fingerprint scanner integrated into the power button. The power button is a long oblong shape, and is slightly concave to make it easier to place your finger in the correct spot. I actually really like this scanner, and so far I've found it to be faster and more reliable than the in-display scanners on the S10 and S10+. I also like that you can wake and unlock the S10e in a single action. Like its bigger brothers, the power button is a little high up on the right side, but due to the phone's more compact size, it isn't as big of an issue. 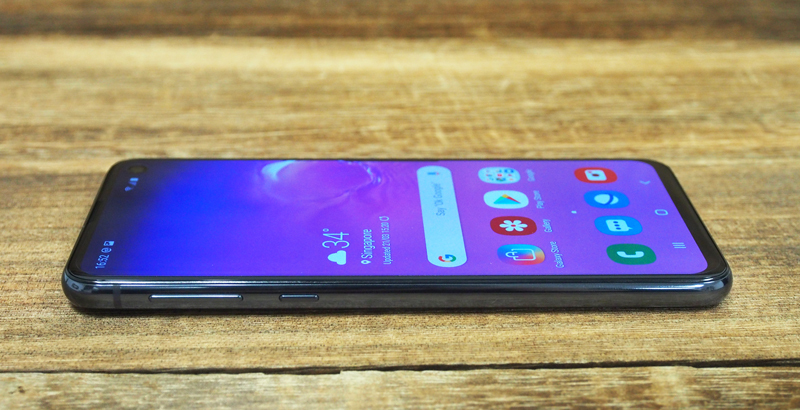 Instead of the usual curves you find at the back of most flagship smartphones, the back of the S10e is flatter to match the front. And instead of the S10's triple camera setup, the S10e sports a dual rear camera pairing a 12-megapixel variable aperture f/1.5 + f/2.4 wide-angle lens with a 16-megapixel f/2.2 ultra-wide-angle lens. I would have preferred a telephoto option instead, but I suspect that would have driven the price up. On the left side of the phone, you'll find the volume rocker and dedicated Bixby assistant launcher. Unlike previous years, the Bixby button can now be remapped to launch other apps. While the button has three options - single press, double press, and long press - only the first two can be remapped. Long pressing the button will always launch Bixby. 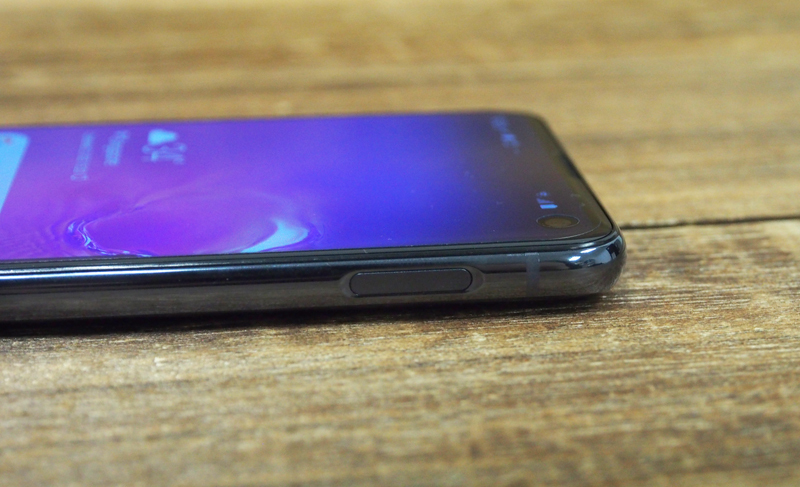 Like the S10 and S10+, the bottom of the phone houses a USB-C port, a downward-firing speaker, and a 3.5mm headphone jack. 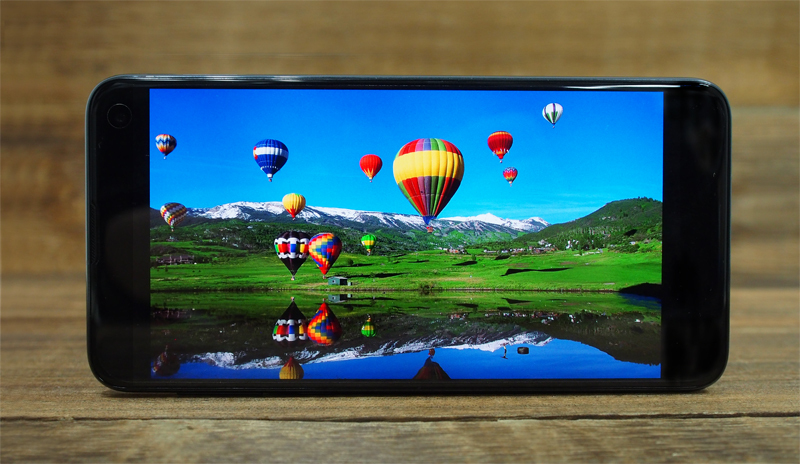 As with all Samsung flagships, the S10e is IP68 rated against dust and water. 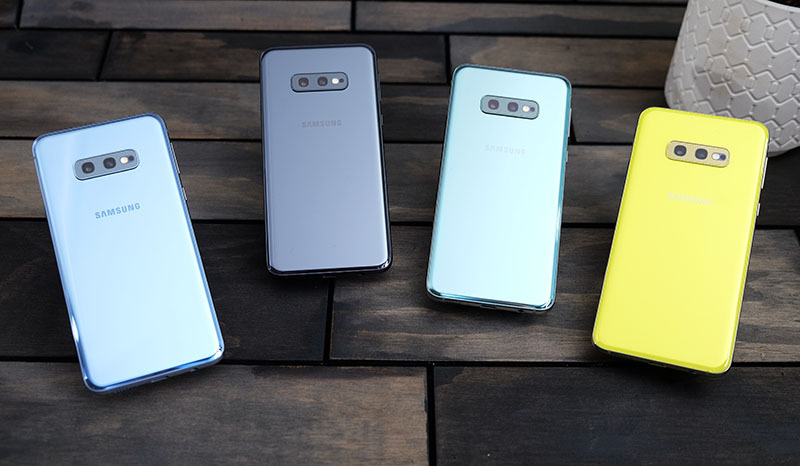 The S10e is available in the same Prism colors (Black, White, and Green) as the S10. There's also an interesting Canary Yellow color, which even includes a gold frame, but unfortunately it's not currently available in Singapore. The S10e has a 5.8-inch, 19:9 aspect ratio Dynamic AMOLED display with a Full HD+ 2,280 x 1,080-pixel resolution (438ppi). Technically it has lower screen clarity than the higher resolution S10 and S10+, but honestly, I can't tell the difference comparing the three phones side by side. The S10e is plenty sharp, and just like its bigger brothers, it has excellent color reproduction, great contrast and wide viewing angles. The display is exceptionally bright too, with a maximum 1,200 nits, which is practically unheard of, especially for an OLED display. Like the S10 and S10+, the S10e's display supports HDR10+, an HDR format championed by Samsung. One thing to note is that, right now, there's very limited HDR10+ content out there. In fact, it's pretty much limited to some content on Amazon Prime Video, although Netflix has said it's open to supporting HDR10+ in the future. 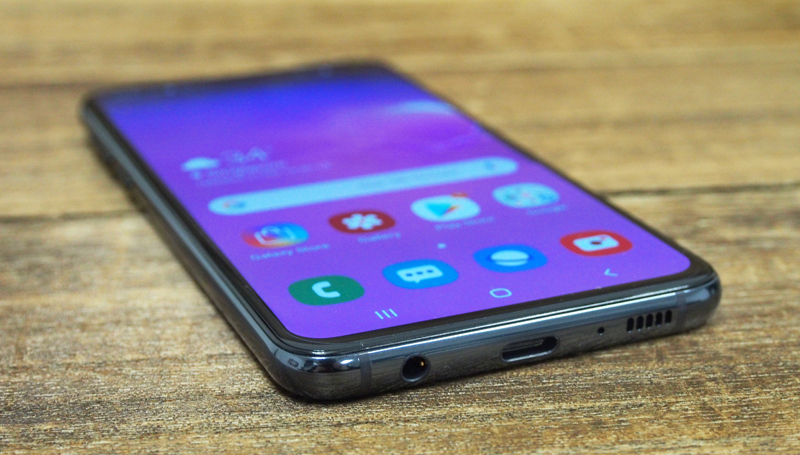 The S10e has the same stereo speaker setup as the S10 and S10+, using one speaker on the bottom of the phone, and the earpiece above the display doubling up as the second speaker. The speakers are tuned by AKG and are very loud, with a surprisingly decent amount of bass. 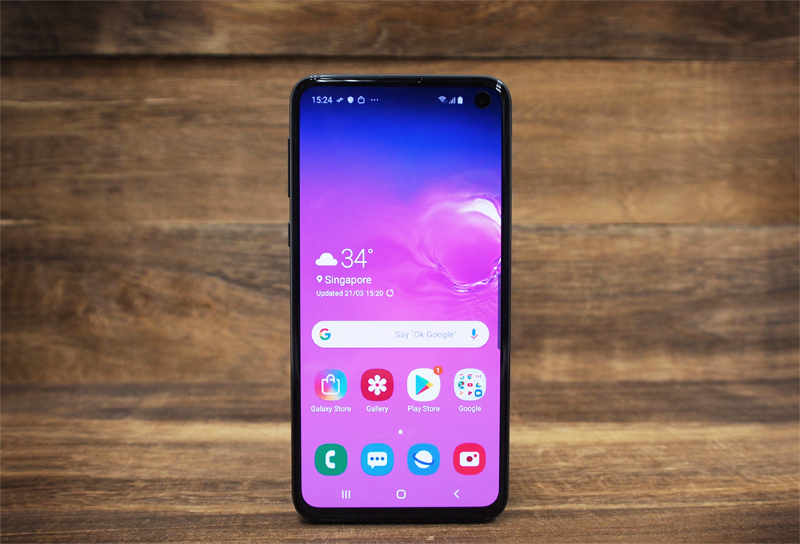 The S10e runs on Android 9.0 Pie with Samsung's new One UI out of the box. 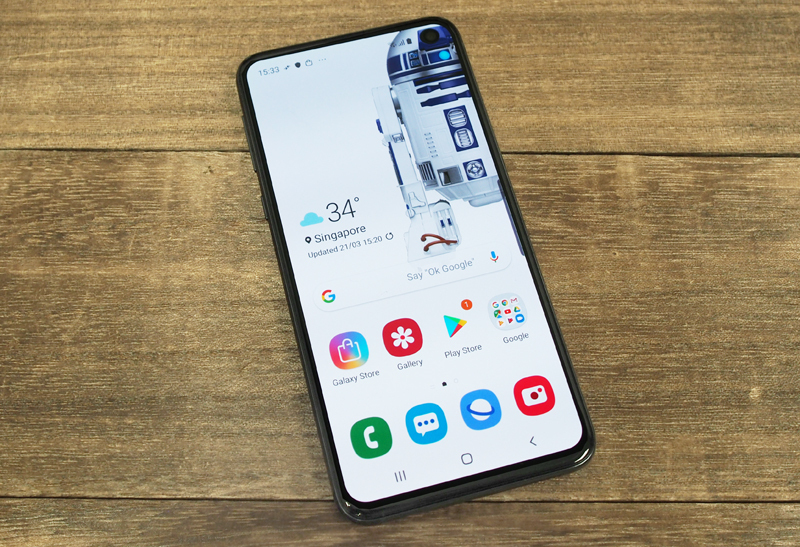 Although the S10e's compact size already makes it a breeze to handle one-handed, I still appreciated One UI's new focus on one-handed usage. In One UI any content that you interact with is pushed to the lower half of the screen, all within easy reach. You can then tap on that content to expand it to full screen. One UI also introduces gesture controls to make navigation simpler: Swipe up from the center to go to the home screen, up from the right to go back, and up from the left to see your recent apps. Swipe up and hold to launch Google Assistant. One UI also includes a new dedicated Night Mode that you can toggle through an option in the quick settings menu. I really like Night Mode - the entire S10 range feels built for it with their OLED displays turning the entire UI a gorgeous pitch black color.